PATRICK WILLS, A 59-YEAR-OLD AMATEUR, had a pretty good day recently at Laurel Hill Golf Club in Lorton, Virginia. 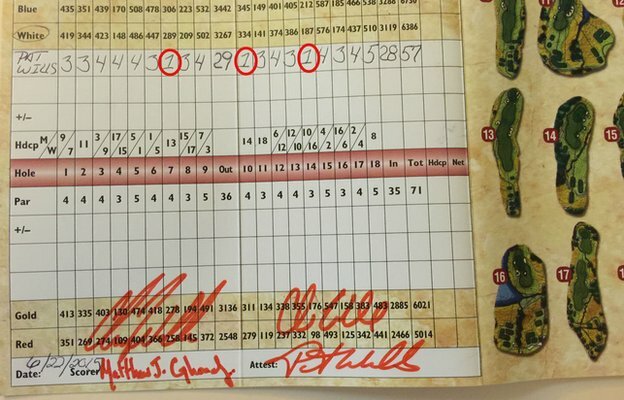 Playing in the Summer Solstice tournament with his sons Charlie (29) and Christopher (27) and Matthew Ghormley, the former Marine shot a 57 that included three holes-in-one, two of them coming on par-4 holes. "When we got to the green I looked down and I don't even know what I felt -- I was dumbfounded," Wills told BBC Sport about recording his third ace of the round. "I don't know if I broke out in joy such was the disbelief. It was unreal. I had never experienced anything like that before." The odds of making three 1's in a single round are astronomical -- "well into the billions," reported BBC Sport. Laurel Hill golf director Gene Orrico verified the scorecard. "I was shocked," Orrico said. "I have been around golf for a long time, read the stories, and to have three [holes-in-one] in one round is incredible. Patrick has been around a long time, he is an honourable man and well respected." The 57 on the par-71 layout was the middle round, one of three 18s played on the same day. In the first round Wills scraped it around in 68. (Ha ha.) He closed with a 66 for a 14-under total and his 20th victory in the Summer Solstice tournament. He is a plus-4 handicap who has now recorded more than 20 aces, all in tournaments. BBC Sport has a detailed writeup of Wills' 57.